The Bad Bear brown ale is a beer I brewed back in October, but just now am getting around to documenting the beer. 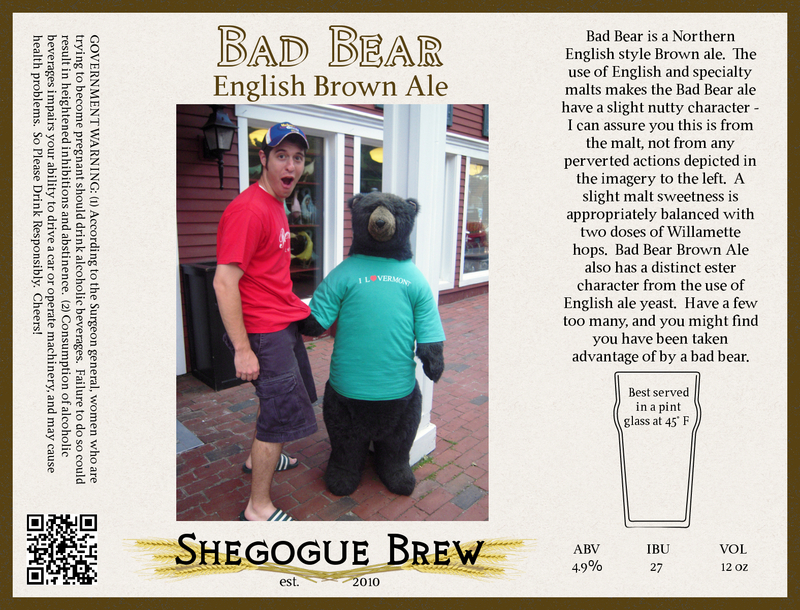 As you can see, I am enjoying creating these labels for the beers. Hopefully, I don't offend anyone, but I figure if you are old enough to drink beer you are old enough to handle some humor in the labels. Tasting Notes: The beer pours an auburn red to brown color which is fairly clear, but not crystal. The beer has a sweet and grainy malt aroma, but also has a dominate aroma of musty-fruity esters from the English yeast. The beer is very balanced, but leans slightly more towards the malty side than bitter and the overall taste profile is somewhat muddled from the tangy/tart yeast character. The beer has a creamy mouthfeel and finishes with just enough dryness to invite you back for another sip. Overall, I will definitely be making some changes the next time I make this beer. I have read in the online forums some dislike for the Safale S-04 dry yeast, and I unfortunately agree. This yeast was said to be very funky when fermented in the upper 60s and even result in a tangy very estery beer in the lower 60s. I find this to be the case as the ester character really overshadows any of the discerning malt tastes I was hoping to achieve with this beer. I fermented this beer at 63° and after initial fermentation (4 days) allowed it to creep up to 66° or so. I have followed a similar fermentation regimen with WLP002 (English strain of liquid yeast) in my English Mild where I felt the malt character really shined. After my own personal experience and of the online community, I think I will be leaving the S-04 dry yeast out of my yeast library in the future. So next time - different yeast, same grain bill.